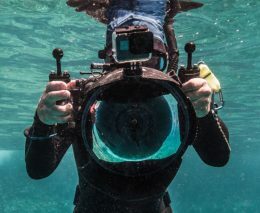 Documentary film makers Danielle Ryan and James Sherwood travelled to Komodo’s coral reefs in search of pristine coral. And they were not disappointed. Danielle writes about their search for pristine coral and their new-found love for adrenalin diving. As we travelled to Komodo in search of pristine coral reefs, I was reading David Attenborough’s ‘Adventures of a Young Naturalist’, excited to explore this World Heritage region that he first visited in 1956. Attenborough described islands “surrounded by treacherous shallow reefs and blistering eddies and whirl pools”. 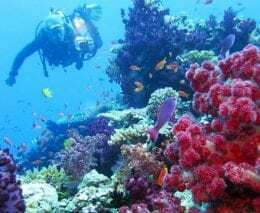 He writes; “the coral lay thick beneath us and when I stuck my head underwater, I saw a vibrant coral landscape flourishing with life, the corals, pink, blue, and white, grew in humps, spikes”. And while Attenborough travelled to Komodo in search of dragons, we went in search of healthy corals. When we signed up to a dive trip to Komodo in May 2018, more than 60 years later, I was worried the place would still feel as remote and pristine as the descriptions in Attenborough’s book. Simon Mallender, one of the co-founders of Diveplanit, reassured us that Komodo was the place that we were searching for if we wanted to see healthy reefs. 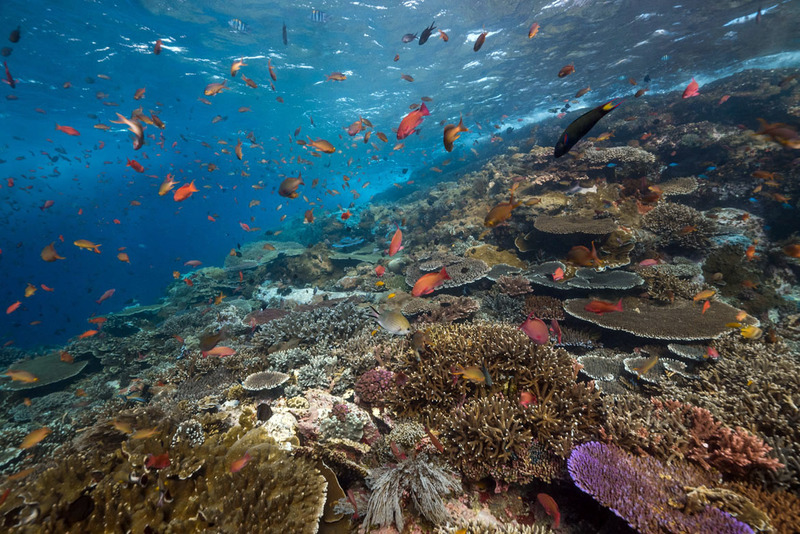 However, we still had our reservations as coral ecosystems are very fragile and today it is hard to tell, merely by browsing through photos online, if a reef is still as healthy as it was a year earlier. We worried we would arrive to find bleached, dying reefs, as we had seen many stressed reefs in the past year. 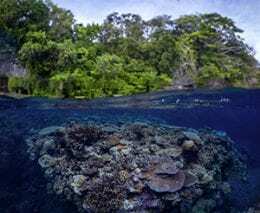 We speculated that Komodo’s famed strong currents might have kept the corals cool, working as a buffer against warming ocean temperatures. When we first boarded the Blue Manta, we discovered that we were the only passengers not to have visited Raja Ampat (another premier Indonesian dive location) and the majority on board had already dived Komodo. 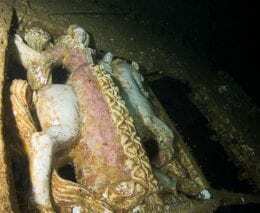 Most had dived both locations more than once, which made us feel hopeful that we would get to see what we came for – we imagined these places must be pretty special, if people are returning to them. On first impression, it sounded like we should have visited Raja Ampat, as everyone kept on raving about the corals. They kept reinforcing to us with immense excitement that Komodo was more about ‘adrenalin’, about currents and the big creatures they attract. We wondered whether we had made the right choice. And we soon discovered what everyone meant by ‘adrenaline’! We spent most of our time in the Northern end of the Komodo, because a big swell was sweeping through the area from the southern end of the park, and we were happy to stay here, because it meant we were able to dive some sites twice. This is something we really enjoy doing, because you never know what you are going to see each time you dive a reef. No dive is ever the same. 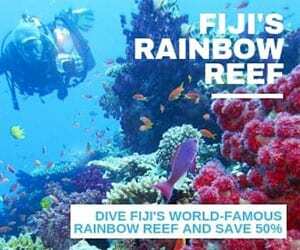 Many dive sites, such as Shot Gun Alley and the Golden Passage, are like a rollercoaster ride as you get swept up in a current shooting through a canyon or past a wall, before you ‘hook on’ with your reef hook or with your dive stick. 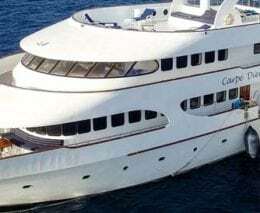 You barely have to move to see turtles, mantas, reef sharks, and big schools of fish cruising past. Although James and I had travelled here for a motives other than an ‘adrenaline’ adventure, we quickly got caught up in the buzz. 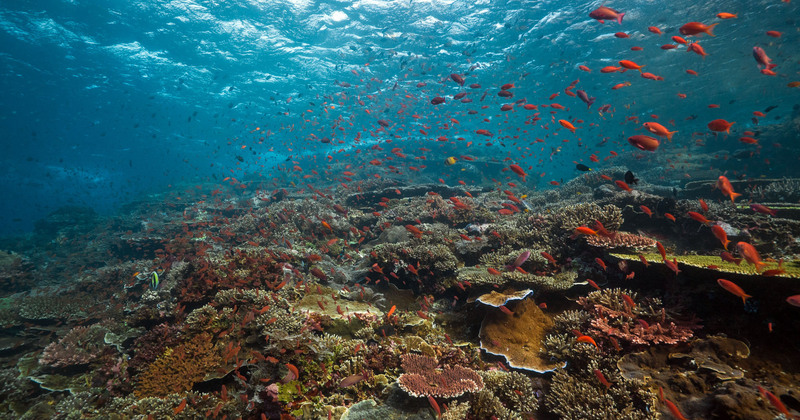 And to our great delight, our desire to explore healthy coral gardens was also satisfied! The dive boat sometimes provided two dive options for the day – adrenaline or coral – which suited us perfectly. We marvelled at the variety of landscapes, some with acropora corals, like staghorns, branching and table corals, while others were dominated by a variety of soft corals. As acropora corals are more susceptible to warming temperatures than soft corals, we were excited to swim through a thick garden bed of colourful hard corals. To us, it was the equivalent of watching an elephant or rhino in the wild – we felt privileged to see this increasingly rare natural wonder. 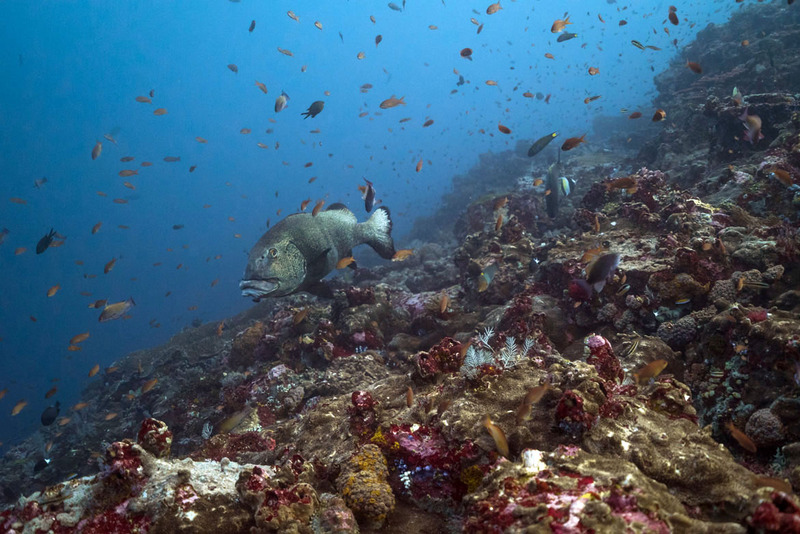 We barely saw any bleached corals in Komodo – maybe only one or two corals at most. I cannot remember a dive over the past year where we have seen such a landscape, untouched by bleaching. 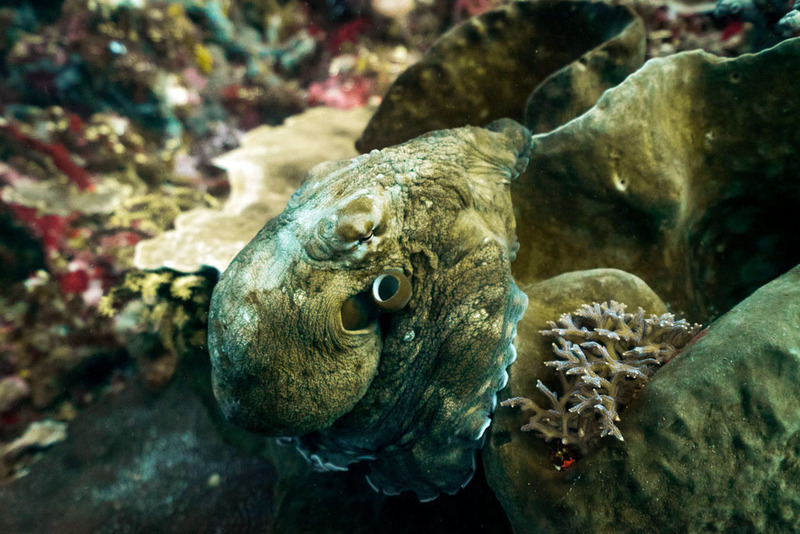 Komodo’s underwater world has outperformed our expectations. We felt that we truly did get to see a glimpse of what Attenborough saw in the 50s, including the mountainous islands with vertical cliffs, even the dragons he came to see. I can only imagine what Komodo’s underwater landscapes might look like here, if the level of marine protection was strengthened even further. 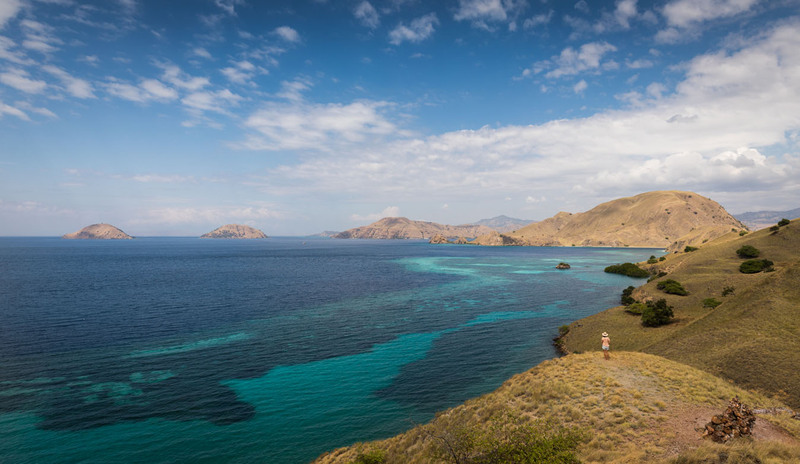 While Komodo is a protected area, the region does not enjoy 100 per cent protection. The dive operators report seeing fishermen fish for species like tuna while people are diving on the same reef. (Fortunately, we never saw this). This region is becoming dependent on dive tourism, and if authorities are able to negotiate with the locals to create ‘no take’ zones, the locals might benefit with increased diver satisfaction. Whirls pools, vibrant coral cover, swarms of red anthias, several large turtles on our first dive (but not on our second), and we spotted a couple of briskly moving sharks. We were lucky to dive this site twice. The second dive was the best. We were surrounded by mantas coming in and out of the blue. The visibility was low, about ten metres. The currents were strong. The mantas were very curious. One sat right next to me, starring at me and even gently touched my head! It was one of the most exciting moments of my life. Coral garden is located in a protected bay, full of soft corals, fans, and other hard corals. Here we saw a cuttle fish and we were mesmerised by the blue anthias. The clearest visibility of the trip. We marvelled as a pygmy manta swam back and forth as did numerous large schools of fish, unconcerned by our human presence. It was a wonderful experience swimming into a school and being wrapped up in a blanket of fish. This we also dived twice. We hooked onto the reef and sat in the current as sharks zipped past. 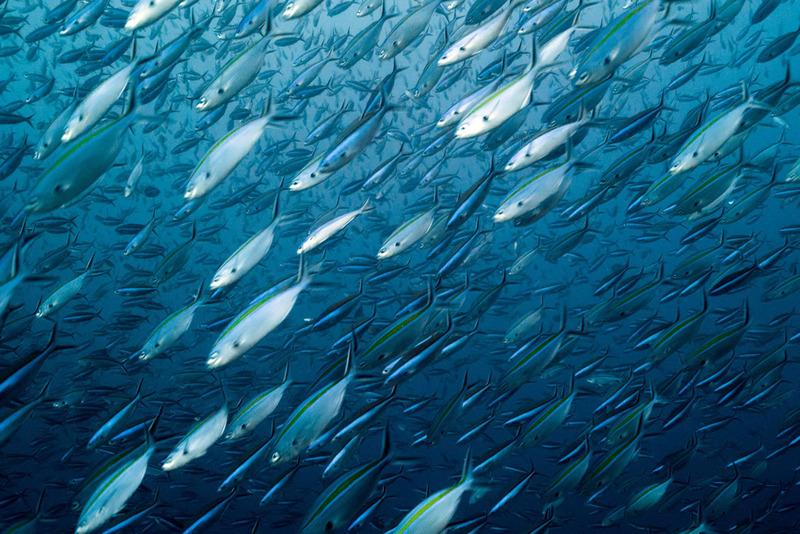 There were many big schools of fish like surgeons and jacks. Some of the most beautiful hard coral gardens I have ever seen. Apparently, this area was hit by a storm a few years ago and the corals were destroyed. Our dive guide was very impressed and pleased to see it bounce back in full bloom. (This coral garden was my favourite). I also enjoyed the adrenaline of going through the quick currents just after seeing this special garden. We found many sleeping turtles and sharks tucked around a coral garden, before taking another fun drift to our exit point. Danielle and James are the creative minds behind documentary film production company; Bluebottle Films. Their latest film, The Map to Paradise, is an adventure-filled tale about the birth of the global movement to protect the sea. The documentary features Prince Albert II of Monaco, President of Palau Tommy Remengesau, Sea Shepherd’s Captain Paul Watson, National Geographic Explorer Enric Sala and more. Also featuring original music by Emmy Award-winning composer Daniel Clive McCallum and hand-painted illustrations by Anna Outridge and Mia Grimaldi. The Map to Paradise – Trailer (2018) from Bluebottle Films on Vimeo.